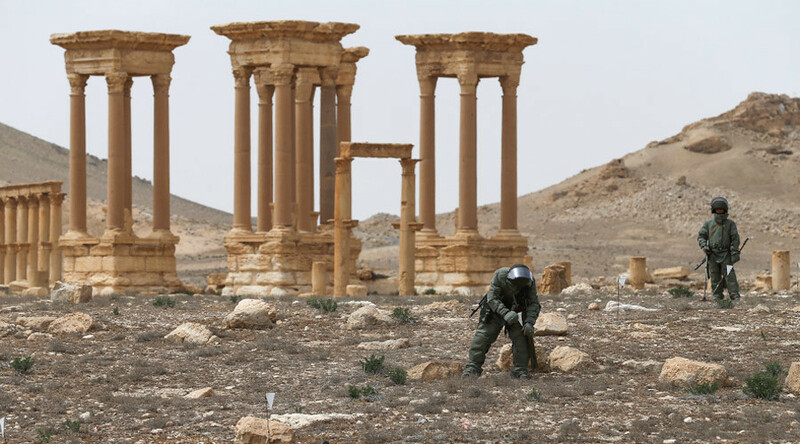 Russian combat engineers, clearing the Syrian city of Palmyra of explosives left behind by Islamic State jihadists, have discovered and defused “one of the largest jihadist arsenals” of more than 12,000 explosive devices. "The warehouse was well-disguised and discovered through the use of special equipment, brought by Russian engineers to Syria,” General Igor Konashenkov, Defense Ministry spokesman, told reporters. “They have removed more than 12,000 explosive objects, including large-caliber mortar mines, artillery shells, as well as anti-tank mines and anti-personnel landmines, from the terrorists' cache." He stressed that this is "one of the largest ammunition depots from which improvised explosive devices and bombs were used by Islamic State [IS, formerly ISIS/ISIL] for terrorist attacks not only in the province of Homs but in other areas of Syria just as well." 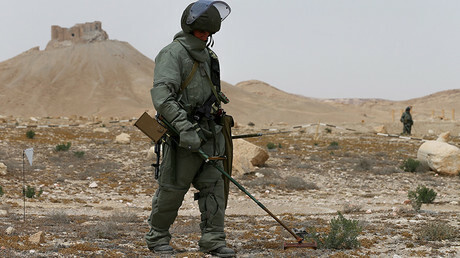 Sappers from the Russian Army's International Anti-mine Center were deployed to Palmyra following the Syrian government's request to help de-mine the city. Palmyra was recaptured by the Syrian Army backed by Russian forces on March 27. According to the spokesman, the warehouse was discovered by Russian combat engineers on the outskirts of the city of Palmyra. The terrorists' arsenal was protected against accidental discovery by trip wires connected to nine demolition bombs. "Worthy of note is that the discovered arsenal contained about a thousand electronic detonators and home-made radio-controlled detonators used for equipment of improvised explosive devices," Konashenkov said, adding that the cache was neutralized, with explosive devices cleared and taken to a safe place for disposal. Earlier this week Russian engineers completed clearing of explosives the architectural and historical part of the UNESCO World Heritage site. With the help of Uran-6 robots and specially-trained dogs Russian engineers have cleared 234 hectares of land, 23km (14 miles) of roads and 10 architectural objects since April 2, the head of the Russian Army's engineering unit, Yury Stavitsky, said on Thursday. In total, 2,991 explosive devices, including 432 makeshift bombs, have been defused. Ninety-eight Russian servicemen have been involved in the effort.